Where do you want to go? Where do you reside? 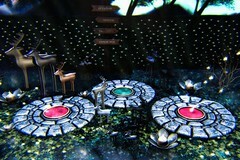 Featuring Plastik Salina Deer Decor & Raindale Alouin + Forest Crossway Set. ⚪ Plastik Salina Deer Decor at Shiny Shabby until April 15. Salina Deer Decor has 13 colors with 3 deers, each with different leg sizes. 1Li each with permission to modify and copy. The price is 239L$. I also used Plastik’s Annris Candle decor in this post. ⚪ Raindale Alouin Platforms at We Love Role-Play until April 30. Alouin Platforms have 2 versions, with and without water/portal in the middle. In default size they have a Landimpact of 3. You have the option between 3 colors and there is a color pick in the HUD for tinting. You can use these platforms for teleporting as it also comes with a special scripted version. They are at 25% off sale during the event for 150L$. Raindale Forest Crossway Set at The Liaison Collaborative until April 26. This set has a Signpost, Stump with or without ax and Ax. These items also have a Landimpact of 1 in default size. A cool option is that you can customize the directions on the Signpost with the included template. The Stump without ax has 12 sit animations. Price for this set is 200L$. I also used Raindale’s Grassmere Hedge Wall in this post. All Raindale items have permission to copy and modify and have SL Materials Enabled. Grass: HPMD by Sasaya – Sweet Garden Grass01. Aurora: *SR* design by Setu – Simple Aurora Wave. Lantern Potted Tree: HEXtraordinary by Corwin Lacourte – Hanging Lantern Branches. Wisps & Ivy: Dysfunctionality by Anke Sillyfish – Wisp Spirits & Twinkling Ivy.